I feel unqualified to talk about home décor because I don’t do too much of it, and what I do do is more often dictated most by how inexpensively it can be done. 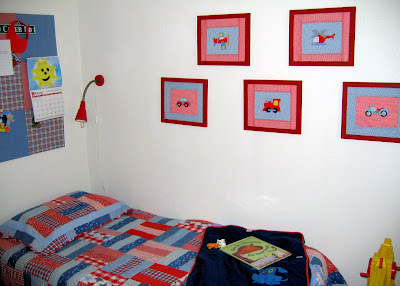 So, here are a couple of cheap/simple projects that I recently did to try and put a little fun in my little boys’ room. I found these cute painted wooden shapes half off at a craft store, so picked them up even though I wasn’t sure what to do with them. What I eventually came up with were these wall hangings. A couple of years ago I bought some basic wooden frames on eBay for a different project I was doing (they ended up being about $1 each), and these five were left-over. I just painted them with acrylic paint to match the room. The fabric was scraps left from when I made my boys’ quilts. I cut rectangles and then sewed another fabric on the edges, and ironed the seams. I hot-glued the cloth onto foam core board cut to fit inside the frames, then put the frames and fabric boards together. Finally, I just hot-glued the wooden transportation shapes to the center. My 5-year-old thought he was pretty cool when I let him help operate the hot glue gun a time or two. The other project was for a dresser we refinished a while ago. We removed the ugly 70’s door-knocker-style drawer pulls, and I wanted to put something cute on to match the colors in the boys’ room. Initially, I found these really adorable transportation-themed drawer pulls on eBay, but they didn’t last a month before they were breaking. I debated spending $5 each for some other cute ones online, but couldn’t bring myself to do it. Instead, I bought plain wooden knobs and painted them with a basecoat of blue. My two year old thought he needed to help with this project. Don’t worry, his paint was washable. 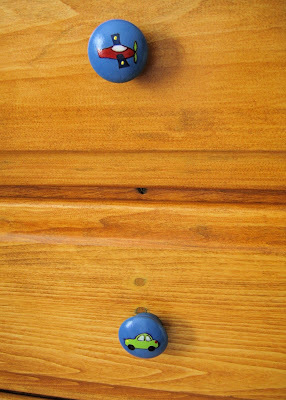 When the blue was dry I painted little pictures on the knobs, and outlined them with a fine Sharpie. The final step was to spray with some clear lacquer. I actually messed up a couple with this last step because the Sharpie ran. I’m not sure if I applied too much of the wet lacquer, or if I should have let the ink “dry” a little more. I was able to mostly fix those knobs by re-painting over the Sharpie, and was extra careful when I lacquered them the second time. For more fabulous and frugal decor ideas, don’t forget to check out The Shabby Nest’s Frugal Friday Party! Very cute ideas! Love the room! Thanks for sharing! I can’t believe you painted those tiny pictures on the little knobs… they look great! 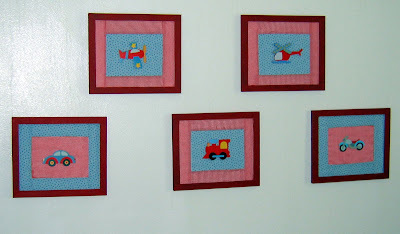 Cute framed pics as well- I”ve seen cute shapes at hobby lobby too. Thanks for the ideas! Great job! I am all about funky knobs, or Sknobs as I like to call mine. The Sharpies and varnish do not mix well. Even on canvas, been there…tried it! You did a wonderful job, I bet your little man loves them! Those wall hangings are adorable! Great ideas! I can’t believe you painted those little transportation pictures on those knobs, nice job! Thanks for sharing! The knobs are adorable! Makes me want to have a boy! What a beautiful room! You did a wonderful job! aww i love how this room turned out! when i was young, my dad and i used to go around the house painting pictures on the power sockets on walls with oil paint 🙂 It was really fun to do as a kid! good old times..